Mix ingredients together in bowl with fork until well combined. Avoid using a mixer if possible, over beating the filling will cause the top to rise and crack after baking. Bake at 300 degrees for 45 minutes. Let sit for 10-15 or as long as you possibly can resist. Feel free to double, triple, quadruple, quintuple, sextuple, septuple, or even get crazy and octuple this recipe. But I can’t find the word for 9-fold so you’ll have to stop at octuple. This recipe came to me from my friend Everlie. We only go back a few months but I do cherish her friendship. She has a servant’s heart, is a wonderful wife, and a fantastic mother to three little boys. Most every time I go into her home she has something prepared on her counter for others; anything from a meal, a pie, or gifts. Just being in her home encourages me to serve others. One day a couple weeks ago I walked in and she had these lined up on her counter, wrapped in cellophane, and each had a card attached. She graciously passed her recipe on to me and it’s one that is definitely blog-worthy! So… go ahead and try it! You won’t be sorry! 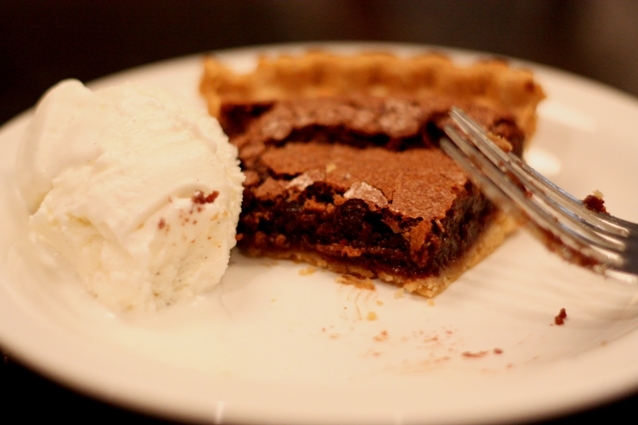 I have a similar recipe for Chocolate chess pie, except it has evaporated milk in it – can’t wait to try this version when we get back home – Love me some warm chocolate pie with cool whip! why do you wait until 830 p.m. to post something that looks so appealing to the appetite. Remember I’m on weight watchers,i’d eat all my points in ONE bite. I’m thinking to make this for the mom tomm. Any recipe that starts with a stick of butter is usually a favorite of mine. Can’t wait to try it. I’m so exited you posted this. I saw it on Erica’s blog. I can’t wait to make it!!!! That sounds delicious! I can’t wait to try it! Delicious! Always interested in hearing about recipes that are kid friendly. My little helper makes baking and cooking so much more fun. Oh, and messy. But it’s a great thing to do on a rainy day! Oh, I can never resist chocolate. I have bookmarked your post. TFS. Looks scrumpt-deli-icious! I have a similar recipe that you can add a cup of pecans to but I think the pure “d” chocolate version looks awesome! oohh I’ve made this! it is good. and easy! Thanks for the recipe it looks so yummy. I found your blog through “Ordinary Days” blog. I saw pictures on Erika’s blog and was going to email you for the recipe. Thanks for sharing it! I love how on your blog you build up other people. I have a close friend and she and her sister are such servants to each other. Whenever I am around them, I want to serve other more, and be closer friends with both of them because Jesus light just shines in them. Hope you had a happy mother’s day! yum! I am making this asap!! Darby – the best part about fudge pie is that it freezes beautifully. It’s just as easy to whip up two and then stick one in the freezer. Unexpected guests? Pull out your pie, slice it frozen and then stick it in the microwave for a few seconds. Voila! You’re the hostess with the mostess!! Loving the blog! Thanks for sharing! I made your fudgey pie last night! I was yummy and super easy. I’ve got two of them baking in the oven — one to eat and one to give to a neighbor. Thank you! This was sooo easy and Great! I made two, one for us and one for my mom! Thanks for sharing! This was so yummy I’m about to make my 3rd and 4th one today for our family! Thanks! Thanks for sharing this! I've made it at least five times now (for us and others) 🙂 and we adore it! I’ve been reading your blog for some time now…my friend uses the same site for her family! Well I love to read blogs b/c you never know what great tips or recipes you will find. I saw this one and decided I have to try to make it this weekend. It was easy and delicious…thanks for sharing!